All dedicated walleye anglers seek to catch a walleye over 10 lbs, considered by many as a once-in-a-lifetime achievement. To accomplish this challenge one must recognize the selection of waters that produce big walleye, using the proper fishing presentations and fishing the best times of the year which increase your chances of landing a trophy walleye. The walleyes range from reservoirs in the South to abundant lakes and rivers in the North. In the South walleyes may reach 2-3 lbs in 3-4 years versus in northern waters where growth is slower and may take over 5 years to reach 2lbs. Walleyes in the North tend to have a much longer life span even though their growth rates are not as high as in the South, but the North still produces many more walleyes of 10lb plus. Large walleyes are exceedingly cautious and wary, if they hear or feel anything unusual they stop feeding and head for deeper water. This why only 2 of 1000 walleyes reach this magic 10 pound size. Pro fishing guides know this and use big fish strategies that result in catching many huge walleyes annually. When considering trophy walleye waters big is best, a large body of water (5000 acres+) is more likely to support big walleye populations than smaller lakes (500-1000 acres). Competition for food, living space and angling pressure reduces the possibility on smaller waters for walleyes to achieve trophy status. Large lakes and flowages provide an abundance of usable forage (minnows, ciscoes & shad), open space and due to large size angling pressure is reduced. Pre Spawn: During the pre-spawn period, large numbers of big females stage into a relatively small area. Although they are not feeding aggressively, you may be able to catch a fish or two due to the sheer numbers present. The pre spawn bite is good until spawning begins. Post Spawn: A few weeks after spawning the big females recover from and start to bite again but finding them is difficult as they are scattered. You may catch an occasional large walleye, but seldom more than one. Your chances of finding a concentration of big walleyes are much better after they have settled into their typical deeper water summer locations. The best fishing begins about five to six weeks after spawning and generally lasts two to three weeks. Late-fall: Fishing is unpredictable, the toughest part is to locate the walleyes, but if you do find them a high percentage will be big. The majority of large walleyes caught in late fall are females. Their feeding for the development of eggs for the spring spawn, females must consume more food than males, up to six times more according to feeding studies. In waters that stratify, after the fall turnover is completed. The depths are warmer than the shallows. Big walleyes may swim into shallow water for short feeding sprees in the evening, but during the day they may be found as deep as 50 feet. Although difficult to find, they form tight schools, so you may be able to catch several from the same area. 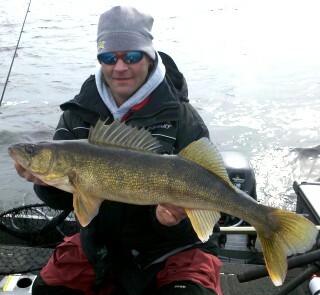 Early Ice: First ice accounts for a major share of big walleyes caught. The best times are during the evening or early morning, just after the ice is safe enough for fishing. Big walleyes will move shallow during this period hunting the baitfish populations that remain from summer time predation. This action occurs for only few weeks as the walleyes use the thin ice and shallow water to herd their prey. As the ice becomes thicker big walleyes will retreat to deeper water and become dormant as winter progresses. Locating big walleyes is half the equation and other half is the proper fishing presentation. Here are a few tips to help you land big walleyes. The first and most common mistake made by anglers is noise, whether it be dropping the anchor on top of the fish, running the outboard over the spot you wish to fish, dropping anything in the boat while fishing or drilling holes on the ice. For position fishing, idle or use an electric trolling motor past the spot you’re fishing and set your anchor at a distance, let the wind drift you over the spot. For trolling use inline planer boards that spread the fishing lines off to the side of your boat. Ice fishing, drill the holes an hour beforehand and let the spot rest. Remember large walleyes are exceedingly cautious and wary, if they hear or feel anything unusual they stop feeding and move. Most often large female walleyes will relate to a piece of structure similar to the smaller males, but will hang 10 to 15 feet deeper this is attributed to a walleye’s increasing sensitivity to light as it grows older. In addition, bigger walleyes prefer cooler water, and they can usually find it by moving deeper. Increase your chances for big walleyes by fishing in the shallows during low-light periods, especially in spring and fall. If the water is very clear, or if there is a great deal of boat traffic, big walleyes will feed almost exclusively at night. During the daytime they prefer relatively deep water, deeper than the areas where you typically find smaller walleyes. In deep northern lakes, the shallow water temperature stays cool enough for big walleyes through the summer. If the walleyes can find boulders or other shallow-water cover to provide shade from the sun they may spend the summer at depths of 10 feet or less. In these lakes, most anglers fish too deep. Increase the size your live bait or lures, they maybe too small to interest a trophy walleye. Many times large walleyes are caught on musky/pike baits in the 6″ – 8″ range. Larger baits will draw far fewer strikes than small ones, and most anglers are not willing to fish all day for one or two opportunities. But if you are intent on catching a trophy that is the price you must pay. Big walleyes are extremely cautious, especially in clear water. You don’t need to over-rig your set-up. They’re more likely to take a bait using a size 6 hook using 6-8lb test line than 12-17lb test with a 1/0 or bigger hook. A small hook will allow the walleye to swallow the bait without feeling anything unusual and will not pull-out or break. Most large walleyes are caught away from snags and take your time to bring the fish in allowing the rod, reel and drag to do it’s job.